Inclusion Ghana represented by the National Co-ordinator and two of its board members were invited to be part of the delegation from the Ghana Federation of the Disabled to meet the President, His Excellency John Dramani Mahama on Monday, 18th March, 2013. Mr Yaw Ofori-Debrah, Spokesperson for the delegation appealed to the government to support the work of the National Council on Persons with Disabilities and increase the allocation of the district assembly common fund for PWDs from 2% to about 3-5%. He added that government should also encourage many television stations to use the sign language to get persons with hearing impairments closer to government policies. 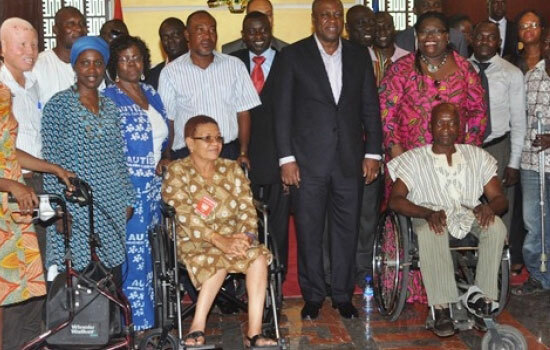 His Excellency John Dramani Mahama gave the assurance that his government is committed to the cause of Persons with Disabilities and that he will make sure the Board of the National Council on Persons with Disabilities is reconstituted with committed and competent persons who would continue to fight for the betterment of persons with disabilities. He said persons with disabilities do not need sympathy from any Ghanaian, but rather their full integration into the society without discrimination. The 4th Inclusion Africa Regional Conference, which will be held from April 8-10, 2013, is being hosted by Inclusion Ghana at the Mensvic Grand Hotel, Accra. With a theme of "Strengthening Our Voices; Building Our Movement", the conference is being supported by Inclusion International and NFU. 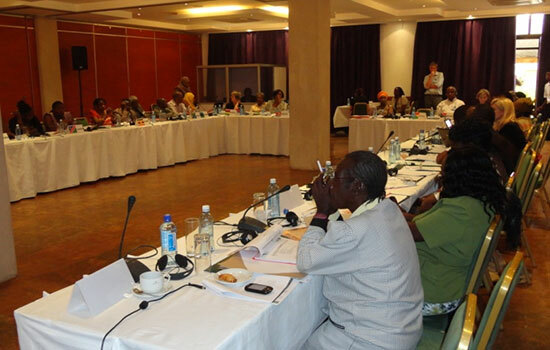 This is the forth grand gathering for member countries of Inclusion Africa following the last Regional Conference held in Nairobi, Kenya in March 2012. Every year we assemble in a member country to exchange what we have learnt, to seek inspiration and innovation and to start or renew relationships that continue to bear fruit long after we return to our communities and our work. This year�s conference will bring together Inclusion Africa member organisations from 17 countries. Should you require any further information on the conference, please do not hesitate to contact the Conference Co-ordinator, Cindy Laird at +233 302 243291 / +233 543 151924 or email to: cindy@inclusion-ghana.org. Inclusion Ghana partners Star-Ghana towards Obtaining Health Care Rights for Persons with Intellectual Disabilities (PWIDs). 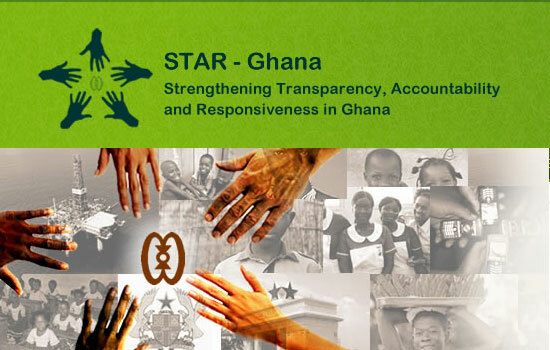 Inclusion Ghana has secured funding amounting to US$150,000.00 from STAR-Ghana to carry out a number of activities in 6 districts (Kwaebibirem, Upper Manya Krobo, Accra Metropolitan, Adentan municipal, Adaklu-Anyigbe and Ho Municipal) aimed at increasing the health coverage by at least 20% from the baseline level of PWIDs population and improving attitudes among healthcare staff for PWIDs in the 6 projects districts by the end of October 2014. Persons with Intellectual Disability are the hardest hit victims of negative labeling when it comes to Persons with Disabilities (PWDs). 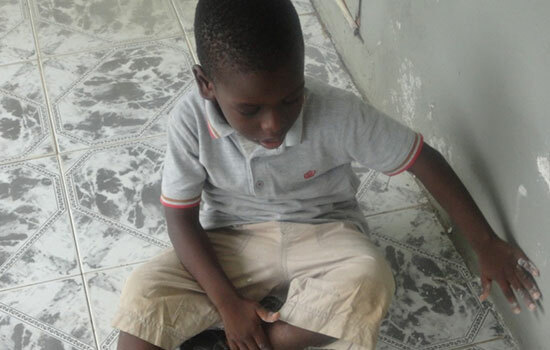 Despite numerous conferences and expert consultations on disability and human rights, and the passing of the Disability Act 715 in 2006, which prohibits stigmatization, discrimination and exclusion of persons with disabilities, relatively little is done in the area of intellectual disability. Provision has been made in Act 715 ensuring that persons with disabilities have access to free health care. The first stumbling block to this is that more than other types of disabilities; strong social, religious and cultural stigma is associated with intellectual disabilities. Secondly, the medical profession have little or no expertise in the identification of Intellectual Difficulty and they do not have the skills to treat the individuals or recommend courses of actions to the parents or carers of the individuals. In addition feedback from IG�s Member Organisations have declared that the free health care is confusing and hard to access. No one health organisation understands their own bureaucracy and therefore refuses to give the aid required of them. Result 1: Improved awareness of intellectual disabilities, existing legislations and policies that promote positive health care by Ghana Health Service Officers, within the 6 selected districts, to PWID to access free, quality health care services. Result 2: Strengthened Institutional capacity at the 6 selected GHS District Offices to respond to the rights of PWIDs by supporting in the free NHIS registration or renewal of more than 200 PWIDs. 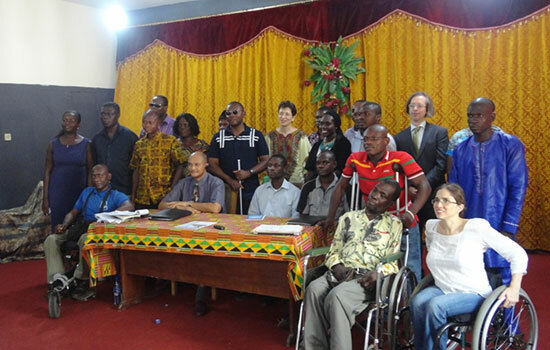 The Disability Rights Fund (DRF) in its efforts to strengthen the work of its grantees in Ghana held two days meeting at the Rehabilitation Centre in Accra from the 19th - 20th February, 2013. The meetings were facilitated by two officials from DRF; Catalina Devandas and Michael Szporluk. The first day meeting had a series of small panel discussions on three major topics that concern all the grantees thus: (1) National level changes and what that means for the DPO community; (2) Inclusive Education; and (3) Efforts to promote greater inclusion of marginalized groups within the disability community (and within society). Representatives from Grantee organizations were invited to lead the discussion according to the topic and their expertise. Inclusion Ghana and the Ghana Federation of the Disabled led the discussion for national level changes and what that means for the DPO community. One of the aims of the discussions on the first day was to generate recommendations that can be given to the guests who will be invited to come on the second day. Present at the second day was the Executive Secretary of the National Council for Persons with Disabilities (NCPD), Mr. Max Vardon. Responding to some of the questions asked him, Mr. Vardon said the NCPD is working hard to ensure the passage of the L.I into law. He also talked about using sports to strengthen the disability fraternity so that families of persons with disability will not abandon their children who have disabilities. He expressed the NCPD�s happiness to be allying with the Ministry of Gender, Children and Social Protection and added that the minister�s background of being a human rights activist and advocate will be of much help to the NCPD. Representatives from the African Youth with Disability Network (AYWDN) and the DFID also expressed their desires to work with the DPO�s for the good of the PWDs in the country. Closing the two days meeting, Michael Szporluk thanked representatives from the Grantee Organisations, NCPD, DFID and AYWDN for making it to the meeting and suggested that all recommendations that were made by the groups should be put into writing and submitted to the agencies that were unable to make it to the meeting. Let's face it, being a parent is a tough job. It's even tougher when you have a special needs child. There are so many emotions that go along with it that it can be very difficult to sort them out.You constantly ask yourself, am I doing the right thing? Would someone else be doing this better? Should I give in to his demands because I feel bad for him having this disability? Am I doing enough? It can be very hard to ever feel like you are doing enough. It is important, though, to remember to keep things in perspective, and remember that you are the authority on your child. Here are some specific tips to help control anger in a child with autism. 1. Ignore Bad Behaviour Aimed at Getting Attention: Many children with autism learn quite quickly that bad behaviour gets your attention�and gets it fast. If possible, try to ignore bad behaviour. Getting upset and giving your child a lot of attention when they misbehave can reinforce this behaviour and create a pattern that you do not want. Don�t let your child do something dangerous, but if his or her behaviour is simply annoying or he is antagonizing you, try to ignore it. Don�t give your child with autism the satisfaction of being able to pull your strings whenever he wants. While this may not eliminate the bad behaviour, reacting to negative behaviour can definitely cause bad behaviour to increase. 2. Let Your Child Burn Off Energy: Children (especially those with autism) need to run around, play, burn off energy. They spend entirely too much time in front of passive activities�TV, computers, card games. Children with Autism need to run around and play. Encourage this. 3. Anticipate and Avoid Problem Situations: Try to anticipate when your child might melt down. Are there situations that cause your child to get angry? Can these be avoided? Many children with autism have a tough time playing with their peers in very competitive games�such as football�where the object is to take the ball away from your child. Avoid these games if possible. Instead, encourage the boys to play a different game. Learn what triggers your child�s anger�and head these situations off before they occur. 4. Hug or Gently Touch Your Child�This Can Work Wonders: By the time a child with autism has a meltdown and gets angry, words can be like pouring gasoline on a fire to put it out. Words simply do not work sometimes. Instead, if your loved one is angry, calmly stroke their back or rub their shoulders. Move the child to a quiet environment�especially one with a dark room and little noise. Remember, many times when a child with autism is angry it is because they became overwhelmed and were not able to process their emotions or handle the situation. Gentle physical contact and QUIET can work wonders in getting your child centered and calm. This is an extract from Craig Kendall Articles, the author of The Asperger's Syndrome Survival Guide.